Thanks to “Let’s Keep Children in Families” charity program implemented by the joint efforts of Ucom Foundation and World Vision Armenia this month as well the Ucom subscribers have helped one more family to create their source of sustainable income. 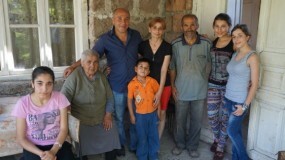 This time the support was provided to the family of Serob and Tsaghik – the parents of two children, living in a village community of Aragatsotn region of Armenia. The family moved to the community a year ago. In order to solve the health issues of the family’s mother they had to sell the city apartment and buy a village house for the rest of the amount. Of children, Knarik goes to school, while 2-year-old Gayane stays at home under the attention of loving and caring parents and her grandmother. This family is extremely poor, the house lacks sanitary conditions. The house has a heating problem as well. The adult members of this family do not have a permanent work, and the only source of their income is the seasonal work of Serob and Gayane grandmother – the pastoralism – and the sickness allowance of the mother Tsaghik. There are no jobs in their community, which complicates the issue of stable income provision. 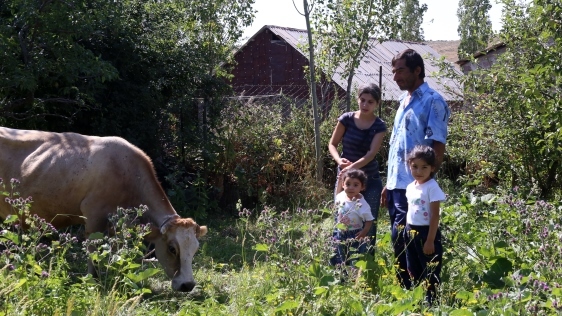 Within the scope of “Let’s Keep Children in Families” program, taking into account the role of breeding for the improvement of the socio-economic conditions of the family, Serob was given a cow, hens and forage to commence his livestock activities, to solve the food and heating problem to some extent and to generate some income. The family parents are convinced that now they will be able to satisfy the most basic needs of their family and to keep their children home under the parental care. “We are grateful to Ucom subscribers for each dram provided for the implementation of this project. Ucom Foundation, as always, doubles the contribution of every single subscriber and puts efforts for the program to be continued and for children to grow up surrounded by parental love and warmth”, - said Ashot Barseghyan, the director of Ucom Foundation. “World Vision has considerable experience in working with vulnerable and disadvantaged families and with the efforts of its experts and social workers handles professional activities, by helping the families develop their individual development plans. The key goal of this work is the improvement of the socio-economic situation in the families, thus enabling parents to keep their children home”, - said Zhirair Edilian, the program director at World Vision Armenia.